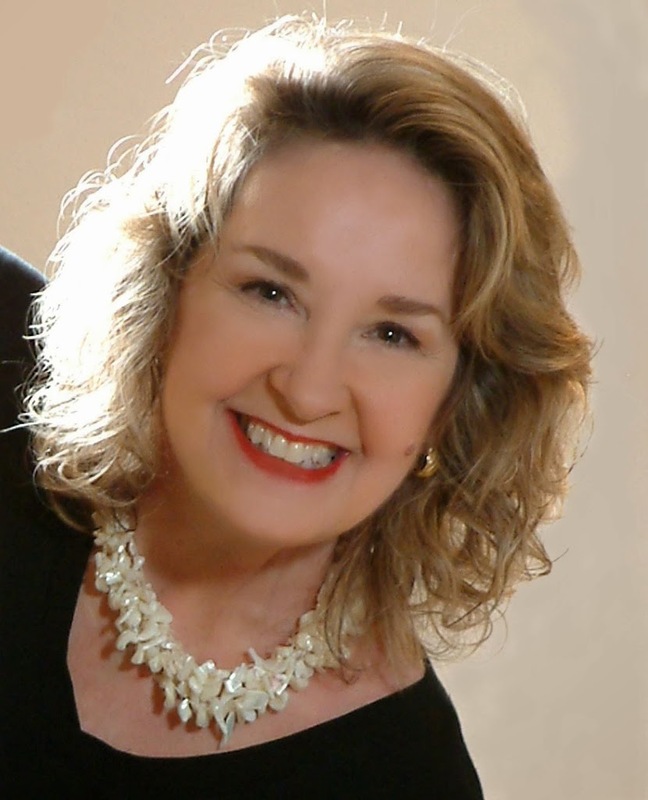 I’m very pleased to have my guest, Jo-Ann Power, at the Kill Zone today. Her new novel involved historical research of WWII that I thought you might find interesting. I’ve bought the book for my mom who always talks about her teens years as “Rosie the riveter” during the war effort. This historical period has been fascinating to me. Enjoy and take it away, Jo-Ann. Grateful to be a guest here at TKZ, I know the importance of solid research for any kind of fiction. Having written a few mysteries and many historicals, I know the value of fact as the bedrock of any entertainment for readers. For HEROIC MEASURES, my novel about American nurses serving on the front lines in France during the Great War, I did research that led me to many of the same resources that many writers use. First, I read general histories for an overview of the conflict. Then I haunted the stacks of the Library of Congress in Washington, D.C. and the National Archives for weeks on end. Newspapers from those years plus nurses’ letters, diaries and photos gave me tiny facts that provided not only color but an accuracy obscured by general histories. Next I went to Army facilities like Carlisle Barracks in Pennsylvania where the Army keeps its repositories of memorabilia of soldiers and nurses who served in that first global conflict. I traveled to Cantigny in Wheaton Illinois where curators there pulled primary and secondary documents from their collection of recruits who served in the First Division of the American Expeditionary Forces. My longest (and most delightful) excursion was to France. For three weeks, I walked the front lines of our American soldiers in northern France. I visited the battle lines, overgrown with moss and grass but many still pock-marked with fox holes and shell holes. I saw the terrain our soldiers fought through. The wide plains of farmland they ran through. The woods where they drew their bayonets and fell into hand-to-hand combat. I saw the territory where peaceful rivers now run and understood by viewing the terrain why keeping control of this river or that mountain was vital to the defense of a town, a section of the land or Paris, itself. I talked with the curators of those museums, the people who live there and tell tales of their ancestors who lived there at the time. I discussed the valor of nurses and YMCA workers, Salvation Army volunteers and ambulance drivers. I walked the pristine rows of American cemeteries where the remains of more than 40,000 of our American men and women lie in testament to their devotion. What did I learn in those trips? I learned about the weather in the spring time in France. Wet and cold. Just as it was so very often during the four years of war. I learned about the fertility of the Champagne and Lorraine regions. The area then was rich: today France grows 20% of the produce for European Union. I saw the importance of the City of Verdun. Nestled in the mountains, this city is the main route for two rivers. Control this city and the victor controls the major water route to Paris. I experienced the diversity of culture in the Alsace where many speak not only French, but English and German. I heard from them how they intermarried, and I could understand how they had to divide their loyalties and how difficult that was one hundred years ago. I also learned from our American directors of our cemeteries that very few Americans come to these hallowed grounds to pay their respects. Most travel to Normandy, remembering the valor of those who took the beach in 1944. But in the coming five years, I hope you will remember the valor of the first group of Americans who went to serve and suffer and fight in Europe. I hope you will rent a car at the Paris airport and head into the Champagne, not merely to drink the best bubbly you will ever enjoy, but to visit these cemeteries, talk to the staff and ask them about the valor of these first American adventurers. They have stories to tell. Mine is fictitious. But based in fact. Here is one woman’s story of her journey from her small hometown to the greater world. I hope you enjoy HEROIC MEASURES. For the purposes of discussion at TKZ, how far have you gone for research and authenticity in your writing? Are any of you writing a period piece involving historical research? If you are, tell us about the challenges. How heroic are you? Would you volunteer to travel thousands of miles from home with others you don’t know to live in tents, wash your hair in your helmet and work 12-24 hours each day? In the Great War, thousands of women did. HEROIC MEASURES is the novel that shows you how American nurses went to war, how they lived and served­—and how they loved. For nurse Gwen Spencer, fighting battles is nothing new. An orphan sent to live with a vengeful aunt, Gwen picked coal and scrubbed floors to earn a living. But when she decides to become a nurse, she steps outside the boundaries of her aunt’s demands…and into a world of her own making. Leaving her hometown for France, she helps doctors mend thousands of brutally injured Doughboys under primitive conditions. Amid the chaos, she volunteers to go ever forward to the front lines. Braving bombings and the madness of men crazed by the hell of war, she is stunned to discover one man she can love. A man she can share her life with. But in the insanity and bloodshed she learns the measures of her own desires. Dare she attempt to become a woman of accomplishment? Or has looking into the face of war and death given her the courage to live her life to the fullest? 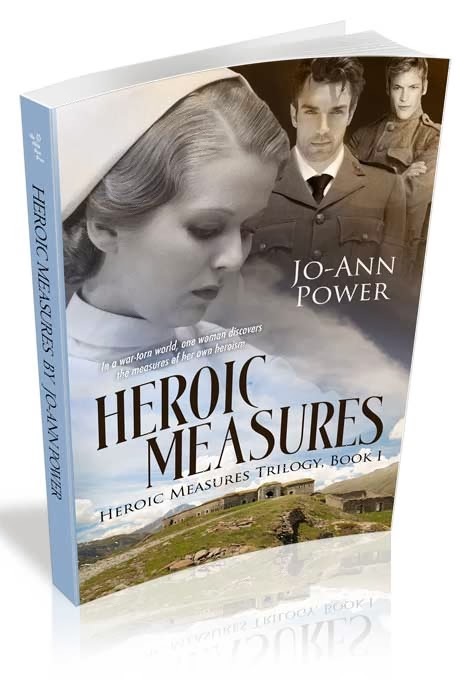 This entry was posted in guest post, heroic measures, historical accuracy, Jo-Ann Power, Jordan Dane, research, Wild Rose Press, WWII by Joe Moore. Bookmark the permalink. Welcome to TKZ, Jo-Ann! Your journey for research sounds absolutely fascinating. I gained a new appreciation for the Great War by watching “World War I in Color”. That series really brought that conflict to life for me. I loved the interviews with the aging veterans–too bad they didn’t include a nurse in the interviews! Kathryn, Please tell me where I can find WWI in Color! It sounds wonderful. And yes, the women of the world do need to be included! Kathryn, Thank you. I will go find it. Clare! A woman after my own heart, you have gone to the IWM and sat to read accounts. I wish I lived in London and could do the same. I can feel the vibrations of your self-confessed history nuttiness! We are, to mix metaphors, birds of a feather! I love well researched Historicals. 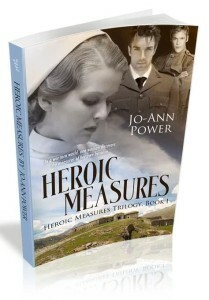 I enjoyed Ann Rice’s WW1 series and will have to check yours out too Jo-Ann. WW1 is an intriguing era for me, one of these days I plan to write a series in that period of time. Currently I’ve got a short titled 1917 I wrote several years ago. Basil, I do hope you like mine as well. True, the main character is a woman, and as those who like to envision their novels as film, HM has a bevy of supporting female roles!!! LOL. WWI is becoming a very vibrant topic in Europe where, believe it or not, they now ARGUE over how the war should be remembered and some even proclaim it is this one’s fault or that one’s. I posit we have an opportunity to revisit that tragic period and try to imagine what we did profit from it, and I do mean all of us, not simply laurels to the victors. Do let me know how you like HM! Welcome, JoAnn! I’ve really developed an appreciation for historical novels and the research it takes to get it right. Thanks for sharing your experience. I bought this book as a gift for my mother who lived during the time of Rosy the Riveter. She loved it. I’m reading next. Thanks for being here on TKZ! I enjoy the research phase. It blows my friend away that 2 hours of research may go into 2 sentences. But if they are the right sentences, then it is worth it. I am off to drum up more visitors here! I loved all your comments and your kind attention to my words. I did have a marvelous time researching this…and you know what? I go back this year! After all, there is a sequel and I must do more digging to tell the stories!